Most people believe content curation is a relatively recent, Internet-born trend, generated by the constantly increasing amount of unverified information available online. The general belief is that “content curation” is a content marketing tactic, designed to provide value to the reader and to save time and writing effort to the author/publisher. Such curation, according to most articles you find online, consists of searching and gathering already published content on a specific topic and to organize it together into a reading list, an anthology or a compilation. In reality, the key elements of an editorial curation practice (finding, gathering, organizing/arranging, value adding, sharing) have a long history and have been utilized by man since thousands of years, to preserve, organize, uncover and highlight valuable poetry, philosophical ideas as well as historical and artistic works. 2) to facilitate the discovery and appreciation of valuable literary works, for future generations. As a matter of fact, before the arrival of the printing press in the fifteenth century, the loss of important writings was not uncommon, as physical books did not exist and publications had to be written by hand on parchments. Thus, unless someone with lots of time available (monks), manually “took care” (curated”) of such content by rewriting it, copying or excerpting parts of it into another manuscript, there were many probabilities that over the course of time, that writing would either be lost, stolen, burned or destroyed. For example, you may be surprised to know that only around a third of Aristotle hundreds of books have survived to this day. Of all those that didn’t make it, we are able to know of thanks to the work of others who have either copied, cited, mentioned, collected, commented, critically analyzed or re-organized his original writings into other publications. In fact, we wouldn’t be able to know and understand the philosophy of Plato and Aristotle if it hadn’t been for the work of such people, mostly religious monks, who, acting as translators, editors and curators, excerpted, referred, inferred and copied a great number of their original writings. In light of this, one could easily argue, that these early editorial / content “curators”, long preceded the art and museum curators who today are so irritated by the wide adoption of the term curation outside their universe, and in particular, online. Note: Museums, as we know them today, have come into being only relatively recently, starting at the end of the fifteenth century. The only historical exception we know of is the babylonian princess Ennigaldi’s museum in Ur (Iraq), discovered in 1925 by Dr. Woolley and dating back to around 500 BC. Thus, it appears that, from what we know now, art, museum and gallery curators have been in existence only for the last few centuries, while content/literary curators have been out there for much longer. If one further explores the history of the literary curatorial practice, one can also discover some fascinating things about its origin, purpose and about the true literal roots of the words that describe this art. There are in fact a number of ancient greek words which describe specifically the work of gathering, collecting and adding value to existing artifacts, writings and ideas. 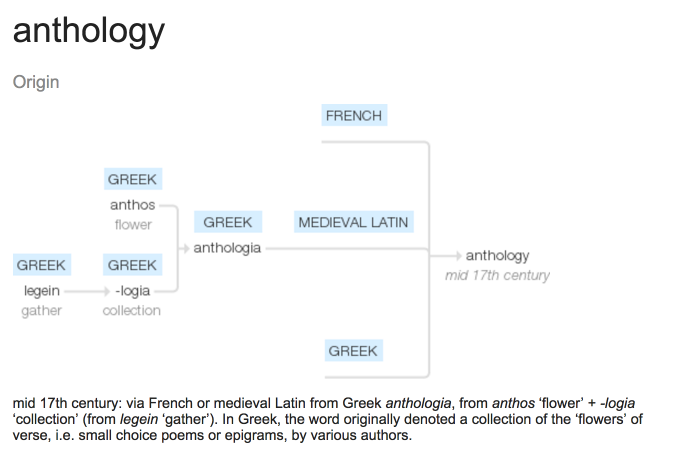 The word “Anthology” entered the English language in the 17th century, from the Greek word, ἀνθολογία (anthologia “a collection of flowers”), a reference to one of the earliest known anthologies, the Garland (Στέφανος), the introduction to which compares each of its anthologized poets to a flower. That Garland by Meléagros of Gadara formed the kernel for what has become known as the Greek Anthology. A garland is a crown made of flower and leaves. A valued source of reliable information on a specific topic compiled by experts. 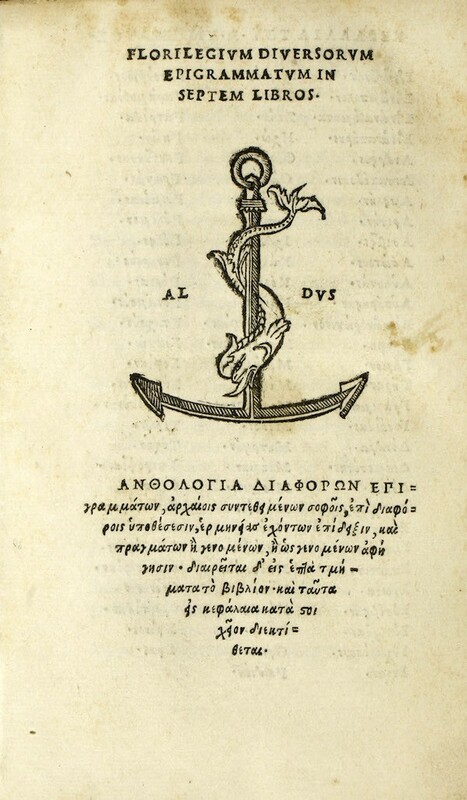 From the greek ἐγκύκλιος παιδεία, transliterated enkyklios paideia, meaning “general education” from enkyklios (ἐγκύκλιος), meaning “circular, recurrent, required regularly, general” and paideia (παιδεία), meaning “education, rearing of a child”. It literally translates as “complete instruction” or “complete knowledge”. The word Encyclopedia generally refers to some type of organized reference work and this is a term that has been used since the beginning of the sixteenth century. “An encyclopedia or encyclopaedia is a reference work or compendium providing summaries of information from either all branches of knowledge or from a particular field or discipline. Encyclopedias are divided into articles or entries that are often arranged alphabetically by article name and sometimes by thematic categories. A collection of philosophical viewpoints. Doxography (Greek: δόξα — “an opinion, a point of view” + γράφειν — “to write, to describe”) is a term used especially for the works of classical historians, describing the points of view of past philosophers and scientists. The term was coined by the German classical scholar Hermann Alexander Diels. A great many philosophical works have been lost; our limited knowledge of such lost works comes chiefly through the doxographical works of later philosophers, commentators, and biographers. Philosophers such as Plato and Aristotle also act as doxographers, as their comments on the ideas of their predecessors indirectly tell us what their predecessors’ beliefs were. Plato’s Defense of Socrates, for example, tells us much of what we know about the natural philosophy of Anaxagoras. A compilation of literary passages organized for the purpose of learning. Chrestomathy (/krɛsˈtɒməθi/ kres-TOM-ə-thee; from the Ancient Greek χρηστομάθεια “desire of learning” = χρηστός “useful” + μανθάνω “learn”) is a collection of selected literary passages (usually from a single author); a selection of literary passages from a foreign language assembled for studying the language; or a text in various languages, used especially as an aid in learning a subject. A modern term indicating the care, collection and sharing of artifacts that have cultural value (physical or digital). Curation is a term derived from the Latin word “curare” which literally means “to take care”. In ancient times a curator was both someone who would take care of human souls as well as someone who managed and protected the material riches of important men. Thus, across realms, the curator has always been a “care-taker”, someone devoted to protect, preserve and enhance the intrinsic value of something. And while today the main connotation of the word curation is the act of organizing and maintaining a public collection of artworks for a museum or art gallery, the origin of the word clearly points to the act of care-taking in the name of longevity and appreciation by others. See also: What is content curation: a collection of definitions. A collection of key “editorial pearls” from different authors generally created with the goal of generating greater value and of preserve culturally valuable content. 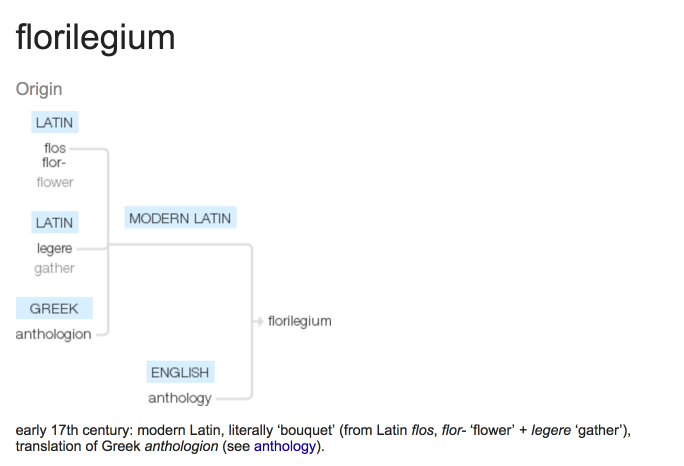 The word Florilegium, literally meaning “a collection of flowers”, was first utilized during the Middle Ages in Europe to describe an anthology of Latin proverbs and textual excerpts. “Medieval florilegia were systematic collections of extracts taken mainly from the writings of the Church Fathers from early Christian authors, also pagan philosophers such as Aristotle, and sometimes classical writings. How did florilegia and anthologies come into being? It appears that the monks in charge of copying, citing and bringing together the best work done by others before them, started to use extra scraps of vellum (the organic material used to write on, at the time) to write key passages, ideas, poems and passages they found particularly interesting or thoughts they wanted to further meditate on. The next step for them, was to collect and bring together all these extra vellum scraps into a cohesive opera, that arranged and presented them in comprehensible and logical way to the reader (by author, by theme or subject, etc.). “While copying manuscripts required time and expense, there were often left over scraps of vellum available for the monks to copy down quotes from scripture or other texts on which they wanted to meditate personally. Such vellum scraps edited into a collection were originally called in Greek: Anthology (ἀνθολογία literally: a gathering of flowers). 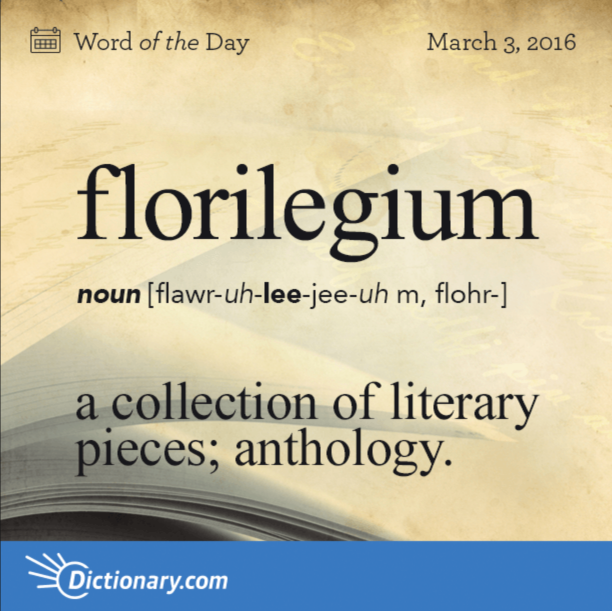 In latin the corresponding word to describe a “flower collection” is: Florilegium (singular) or Florilegia (plural). Boston Globe, November 28, 2010). What records do exist today, in our literature, archives, collections, libraries and museums of such original forms of editorial curation? What follows is a short compilation of historical curation examples, creating an imaginary evolutionary timeline starting over 2000 years ago and leading up to the digital age we are now in. Here are 15 among the most interesting examples of (pre-Internet) curated literary work. A collection of poems, mostly epigrams, that span the classical and Byzantine periods of Greek literature. 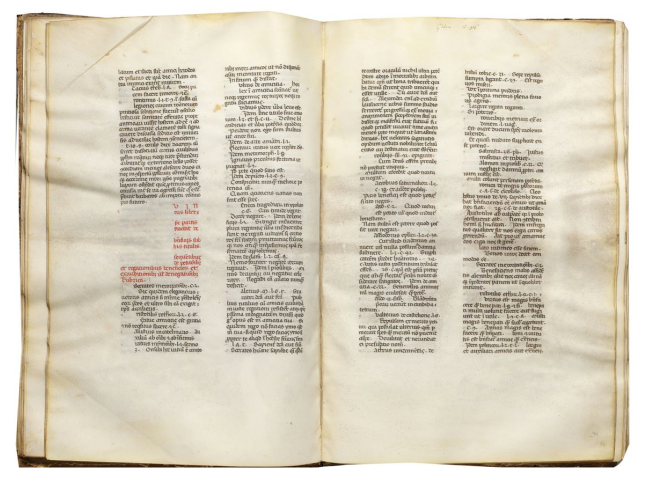 Most of the material of the Greek Anthology comes from two manuscripts, the Palatine Anthology of the 10th century and the Anthology of Planudes (or Planudean Anthology) of the 14th century. 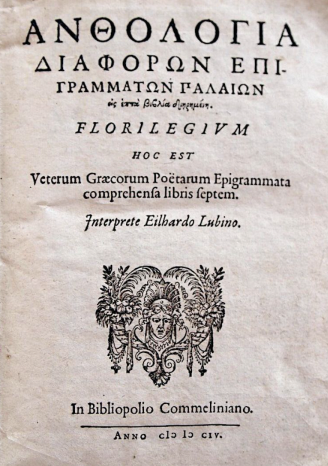 An anthology of Greek epigrams and poems compiled by Maximus Planudes, a Byzantine grammarian and theologian, based on the Anthology of Cephalas. It comprises 2,400 epigrams. It consists of seven books. 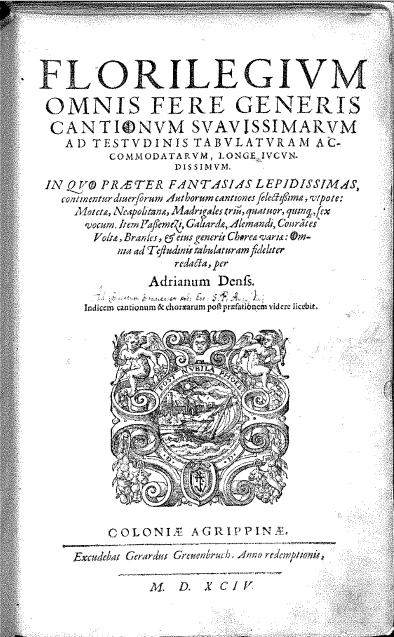 A Latin florilegium containing around 6,000 proverbs and citations from patristic and a few classical authors organized in 266 alphabetically ordered topics. 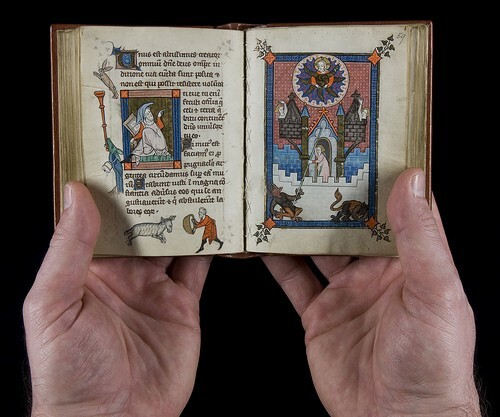 Thomas compiled this collection from books in the library of the Sorbonne in Paris (1306). This florilegium survives in almost 200 manuscripts and it has been published in at least 50 editions between 1483 and 1887, “making it by far the most widely-disseminated and, presumably, the most influential anthology of Latin quotations produced during the Middle Ages”. Includes extensive extracts from classical authors (notably including seven passages from Catullus) that testify to the author’s early humanist interests. 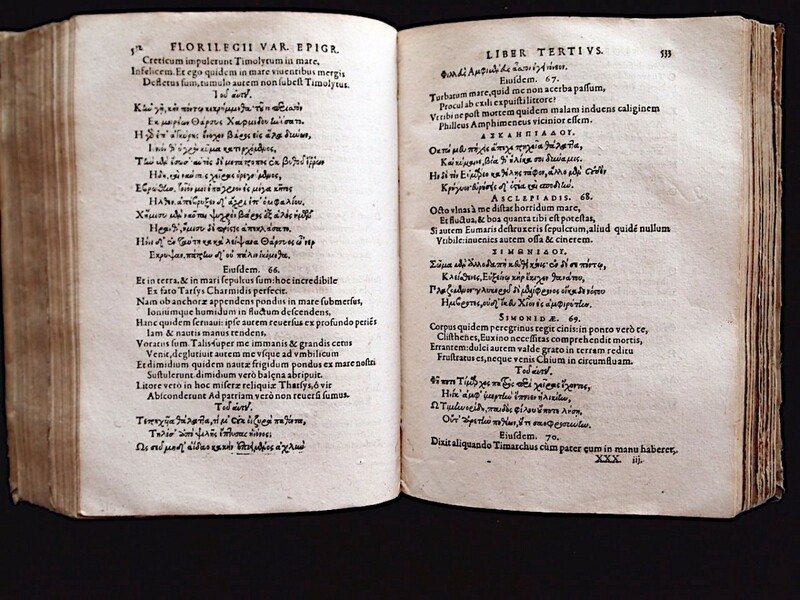 The Greek Anthology in a newly curated version by the pioneering Venetian printer. Gathered examples of human behavior both good and bad from all periods of history, providing instructive ethical models and supporting evidence for every imaginable argument. One of the most beautiful emblem books depicting allegorical, mythological and secular subjects (an emblem book is a book collecting emblems (allegorical illustrations) with accompanying explanatory text, typically morals or poems). A compilation of the best songs and musical compositions of the time. From Neapolitan songs, to madrigales. A collection of greek citations translated into Latin by Lubin and organized into thematic chapters. A collection of passages, phrases, and proverbs traced to their sources in ancient and modern literature. More info. An anthology of English poetry, edited by Arthur Quiller-Couch, that had a very substantial influence on popular taste and perception of poetry for at least a generation. It was published by Oxford University Press in 1900; in its india-paper form it was carried widely around the British Empire and in war as a ‘knapsack book’. It sold close to 500,000 copies in its first edition. American general-interest family magazine, published ten times a year. The magazine was founded in 1920, by DeWitt Wallace and Lila Bell Wallace. Wallace had the idea to gather a sampling of favorite articles on many subjects from various monthly magazines, sometimes condensing and rewriting them, and to combine them into one magazine. For many years, Reader’s Digest was the best-selling consumer magazine in the United States; it lost the distinction in 2009 to Better Homes and Gardens. Reliable records show that since more than 2000 years we have made use of curation, as an editorial strategy to preserve, highlight, study and make-sense of our cultural heritage. If it had not been for the work of the many patient curators who have been collecting, summarizing and bringing together literary works and information which may otherwise gone unnoticed or lost, today we would know a lot less about our past and about the ideas and stories that influenced who we are today. Selecting, compiling, editing and curating original content written by others into collections, anthologies or other literary formats, while adding value to it through organization, arrangement, translation or commentary, has deep roots in the history of man. It is not a new digital trend or a passing fad. Rather, the explosion of content being published in the digital age has further boosted curation relevance and usefulness, and the widespread and rapidly increasing need need from humans to learn, has made it all but more useful and appreciated. For such reasons curation in the information age may likely see a renaissance of its appreciation and use. When there is too much of anything, many can benefit from trusted experts contribution to distill, summarize and help pick out the wheat from the chaff. Not only. Curation may also be critical in helping us leave a tangible trace of who we are and what we are doing now, since, albeit unknown to most, we live in an age in which we lose the greatest part (and often the best) of what we write, produce or create digitally. We give for granted that once created new digital content will stay there, but the reality is quite the opposite. After a few years, a large percentage of what has been published online, is not there anymore. Thus, however absurd it may sound, we are much more at risk of losing a great part of our cultural heritage today than our old ancestors did. Ink stays. Bits can be deleted, censored, taken down or lost in less than a millisecond. Curation, plays an important role in helping us preserve what our grandchildren may not otherwise ever know. Curation dissected. For the journalist, publisher, educator, change-agent. Focus on how to create value for others by collecting, verifying and organizing existing information.